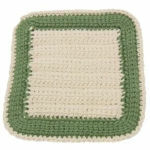 Lacy Jar Topper -- $1.99 A Crochet pattern from Julie A Bolduc. This jar topper would look best slipped over a white cloth covering the top of a jar. This is my first attempt at designing one and even making one so it is probably different from any you have seen.